I sew a lot of stretch fabrics, mostly dance and skating costumes. For the past 20 years or so, I thought “if it stretches, it’s good enough.” But recently I’ve learned the real uses for the different types of elastic. Did you know some types are meant for casings-only because sewing damages them? I didn’t. Here’s a cheat sheet on how to choose the right elastic. Elastic is made from a series of rubber (or stretchable synthetic, such as spandex) cores that are bound or wrapped in polyester, cotton, nylon or a blend of fiber threads. The exterior threads are braided, woven or knit together to create the elastic. It comes in a variety of thicknesses and widths; different elastics have more or less stretch. Elastic can be threaded through casings or stitched directly to the fabric to control fullness in a particular area. Good quality elastic stretches more than twice its length and then returns to its original shape and length. Quality and behavior are determined by the elastic’s construction and fiber content. Almost all elastic is made with rubber cores (although rubber-free elastic can be found if you have a latex allergy.) Generally, the higher the rubber content in the elastic, the greater the stretch. Most elastic is a combination of rubber with polyester, cotton or nylon. The most versatile elastics are a blend of rubber and polyester. They are suitable for wash-and-wear fabrics, synthetic knits and swimwear. Even dry-clean-only items can use polyester/rubber elastic. If you aren’t sure which elastic to use, stick with polyester. Nylon elastic has a soft luster and is used on swimwear and lingerie. It is machine washable, but should be dried in medium heat. Cotton elastic does shrink, but not a lot. It should not be dry-cleaned. It is ideal for wash-and-wear fabrics and can be dried in medium to high temperatures. If you like to sew with natural fabrics like linen, cotton and wool, this is a good choice for you. Elastic is also categorized by how it’s constructed. Each element changes how the elastic behaves and how it should be used. You have a choice of braided, knitted, woven or transparent. Braided elastic gets narrower as it’s stretched. 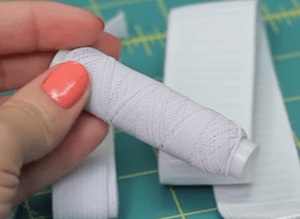 I think of this as the “cheap stuff.” It loses its stretch and shape retention when you sew through it, so it’s really only useful when you’re using a casing and don’t need a strong hold. I use it for sleeve hems and sometimes on loose gathered necklines. It’s very lightweight. You’ll notice, that this elastic becomes more narrow when it’s stretched. It’s only good for lightweight fabric or areas, that won’t experience much stretch. As over time, it will lose its elasticity. Great for like cuffs. This should only be used in elastic casings or channels as the stretch is entirely lost when sewing directly on fabric. Knitted elastic is soft, strong and appropriate for most garments. It’s best suited for lightweight fabrics. This variety doesn’t narrow when stretched and is not affected by needle piercing. 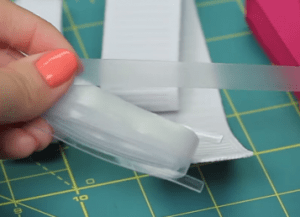 So you can apply it directly to your fabric or use it in a casing. Narrow versions are great for swim and activewear, as well as dance and skate costumes. Wider pieces can be used for waistbands and heavier applications. It’s very soft and has more movement. It’s also very versatile. It can be used in casings or sewn directly on fabric because it’s so soft. It’s great for direct contact with skin, and it’s great for medium and lightweight fabric. Woven elastic (also called “non-roll” elastic) is very strong and usually thicker than the other elastics. It’s used on heavy weight fabrics, including home decorating fabric, upholstery material, even canvas. It has both crosswise and lengthwise ribs, giving it a basket weave pattern. It doesn’t narrow when stretched, and you can sew through it without damage to the fibers. So it’s appropriate for both direct application and casings. This stuff is really strong, but not as soft as knitted elastic. It’s especially great for heavy fabric, as it is so strong and it can be sewn directly on fabric or used in casings. This elastic can be made to be very wide and very thick.It’s great for medium weight fabrics and heavy fabrics. By the way, this little non-roll label simply means it won’t roll on itself when it’s in a casing. Rubber-free, transparent polyurethane is not braided, knitted or woven. It’s a synthetic product that stretches three to four times its length with complete recovery to its original size and shape. It’s usually sewn directly to the fabric, not used in a casing. This type of elastic is used a lot for swimwear and especially for lingerie and costumes where you don’t want visible straps. Clear elastic thread is very thin and durable and can be stretched up to four times its size. These are, of course, great for dancewear and swimwear as it looks better and has less bulk and weight to it. This is also very beneficial to shoulder seams or any seam, that risks losing its elasticity and stability. Like you see with t-shirts. 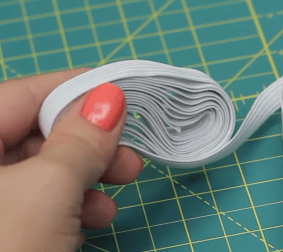 Elastic thread is awesome. It has a ton of uses, but it’s especially awesome for shirring/gathering fabric. It’s done by using the elastic thread in the bobbin and sewing 15 to 20 parallel lines. These elastic is becoming popular and come in a variety of prints and colors. It widths they’re meant to be seen and are adorable for skirts. They make an even thin a variety for like baby diaper covers and cloth diapers. You can find some pretty cool specialty elastics if you know where to look. Foldover elastic is one such animal. This is awesome for a quick edge finish on any stretch fabric. It’s essentially two pieces of elastic joined by a thin channel in the middle so you can fold it over your edge and just stitch it down. Easy peasy! Metallics and stretchable trim is great when your elastic is going to show anywhere on the garment. I use metallic elastic all the time when altering dance costumes to fit different shaped dancers. Buttonhole elastic is awesome for maternity wear. Use it in a casing so the wearer can adjust the size of the garment as she grows. I’ve also noticed kids clothing using this technique, too. Choose thread that is compatible with the fabric. Watch the thread tension; you may need to adjust it when stitching and stretching elastic. The elastic needs to be snug enough to prevent the fabric from drooping, but loose enough to be comfortable. To ensure maximum comfort, wrap the elastic around your body, and pin it closed. Wear it for a half hour, and adjust the length as needed. 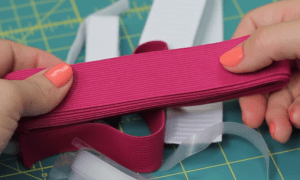 Cut elastic the desired length plus 1″ for finishing the ends. 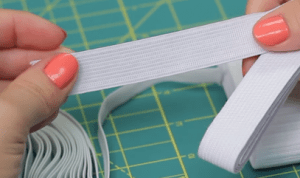 When sewing elastic directly to fabric, cut it about 8 % shorter that the desired length; it does stretch during stitching. 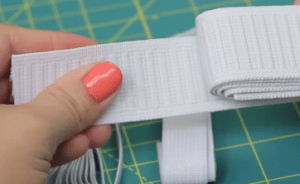 Use a long decorative stretch stitch or a zigzag on your sewing machineto sew elastic directly to fabric. If you have trouble getting consistent stretch by hand, try a special elastic foot. It’s a specialty presser foot attachment that applies elastic without having to stretch it by hand. You get consistent stretch across your entire seam. So, go forth and stretch your imagination! There’s an elastic that’s right for just about any project.